We'll give you a hint, it used to make cars that could fit in a Ferrari's trunk. Auto manufacturers like to uses sales to determine their success. However, sales do not always equate to having the most brand value. The most valuable brands in the world are technology companies like Apple, Google and Microsoft, with the largest automaker (Toyota) coming in at 7 in the top 100. The list of most valuable brands is compiled by Interbrand, and there has just been an interesting move by one quirky, British automaker. BMW's Mini brand now ranks at number 87 on the list, which puts it right ahead of Ferrari. Mini is currently rated at $5.11 billion, which is more than Ferrari's value, rated at $4.87 billion. Another automaker that Mini beat out in the top 100 includes Tesla at number 98 (worth $4.002 billion). These ranks are based not only on sales volume, but by how much the brand influences consumer decision making and pricing. We have a genuine interest in people's lives, interests and passions. We want to do more than just send messages out into the world. We also want to listen and enter into an authentic dialogue with young, urban creatives who strive to live purposeful, fulfilling lives," said Mini senior VP, Sebastian Mackensen. Even in the wake of Brexit, Mini has been having a strong sales year in 2017. Total sales for the brand in the first eight months of the year are up 3.1 percent year-over-year to 230,925 vehicles. 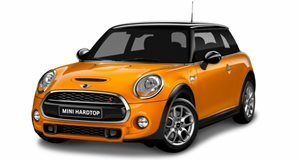 The models with the biggest sales increases are the Countryman with a 12.9 percent increase and the Mini Convertible with a 20.3 percent increase. Mini is still around a billion dollars away from passing the next car company on the list, Land Rover, but this is still great news for the British brand.